The locals speed their bikes and motorbikes, shouting and cursing at distracted flock os tourists, totally unaware of the biker’s rules in the cycle paths. Bikers ‘rule’ the city and one should not mess up with them. Tourists stopping in the middle of a busy cycle path to make selfies or group photos, get the most shouts. Frightened faces abound, caught by surprise. Accidents happen there too. The local tourist office might become a bit frightened too, when the behavior of the locals hurts the city’s reputation. What tourists perhaps don’t know is that the most ‘aggressive’ bikers abide to a no-rules game. The bikers scream at you if you stop for a red traffic light, ride at a slow pace, or occupy the two sides of the path while chatting with a companion. And be aware that no one uses a helmet. Unless they are foreigners! Why this fast pace? Bikers are going to school, work, doctors’ appointments, delivering pizza, mail, and other goods, etc. because biking is not only used for leisure but works as a main mean of transportation in the city. I shot this photo (with a Olympus E-M10 45mm) at the corner of the canal Prinsengracht with Spiegelstraat. That is one busy touristic area, which leads to a park and three museums. While making photos, someone shouted at me too…oops, I had one foot at the cycle path. “This VIP treatment is not only reserved for tourists!”, I thought. Excellent shot, perfect tones (I often struggle to get real blacks in my mono shots) and that S curve is wonderful! Thank you Andy! To get the curve was the reason to step my foot into the cycle path, but that was worth it. In my experience, that step was mighty dangerous, oh what you do, for your art and our pleasure! Lol. I know you have a point on the danger fact! Thank you! I am in love with this photo and post Lucile! 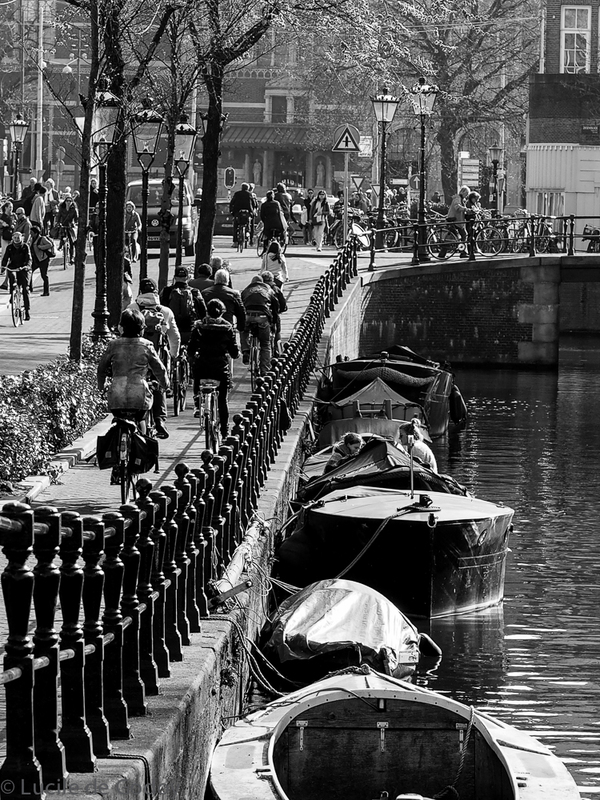 I may have mentioned that I sailed to Amsterdam in 2011 and was thrilled to experience all of the city’s beauty…and it’s bike culture…. like no other city in the world. The photo so perfectly captures it. Just like it is imprinted in my mind. This photo is a work of art that I would love to hang on my wall….maybe when I move off a sailboat and actually have a wall or two of my own. Lisa, your comments make me so happy. You are lovely and generous. You can have this photo whenever you want. It is a honor. I am going to take you up on your offer as soon as I have a wall! I would have liked to watch this! You brought in a good point as this also happens often. Pedestrians have the same behavior. Oh no, you wouldn’t want to see that. It was not funny at all and we walked on quite disturbed. I now imagine that a fight took place there! Yes, you’re right! I side with you in both counts. Locals know this is a top touristic destination, so there is no point in getting upset about that. Tourists follow a relaxed pace, so better accept that to not become insane! My Queen, this really is a superb photo, just glorious! Composition in particular is spot-on! Oh la la… The Queen humbly bows down before the Empress! Thanks DJ! Your encouraging comments make me smile. This is a great photo! I enjoyed reading your accompanying story about the area, too. Thank you so much, Britta. Watching the crowd provides material for many stories. I am happy you enjoyed this one. Oh, yes! The bikers would be yelling at me as I stopped to admire this lovely railing along the water…. LOL. You are one of them! Let me know when you come as I will be making your photos there! Be aware! I’m watching you! Gorgeous photo, such an interesting shot of the traffic…of bikes! I had started to wonder if you had gotten yelled at for stopping to take the photo, and you did 😉 I’m still new-ish to cycling so this would intimidate me!! You got it right! 😉 I knew I was taking a risk to accidentally step my foot there by being so close but hey…we do all for a good shot, isn’t it? I understand the rules (now) after nearly being run over on a path in Denmark. I love bike riding and think it’s a great way of life. Great photo that tells a real story.